We may find our phones, tablets, and laptops indispensable, but after a while, all that plastic, metal, and glass can get a bit monotonous — why not break up the sterile black and silver with a bit of wood? Here are a few of the best options for anyone — especially Mac lovers — who might enjoy the warm and unique look of real wood on their electronics. Anyone who likes not just the look, but the feel of wood may enjoy these key toppers. They're real wood, laser cut and etched with letters in the exact same font and layout as your MacBook or wireless keyboard. Seattle-based Lazerwood's version was a bit thicker and felt more like raw wood — but on RawBKNY's, the letters penetrate all the way through the wood, letting your keyboard's backlight shine through. There are also more color options, like a lovely rosewood and bright cherry. Both cost $40 — and don't forget to set aside half an hour to apply the keytoppers and ensure they're on straight. Want to be a bit more public about it? Lazerwood also makes a similar product for the popular Beats headphones, and RawBKNY has wood protectors for your laptop. If just the top of the key isn't enough, look no further than Oree's stunning all-wood keyboards. These wireless devices can be customized with a variety of woods (we preferred walnut), fonts, and layouts, and yes, they look as good in real life as they do in pictures. The layout is full-sized, but the keys may not be as engaging and clicky as some high-speed typists like, although we found them comfortable enough. Just be ready to field questions from admirers if you take one on the go. Oree also offers a similarly gorgeous wireless trackpad that works on Macs and Windows machines both — we found it to be less responsive as the built-in one, but perfectly adequate for everyday operations. Be sure to check out the leather roll-up pouch and funky iPhone cases as well. Keeping your iPad in a case is generally a good idea, even if it makes it a bit harder to show off the slimness of your new tablet. Luckily, Grovemade's cases are just as striking as the device they're made to contain. The wafer-thin wood still feels like it'll afford a fair bit of protection, and like the smart case it attaches magnetically and folds back to form a stand. You'll need an iPad Air for these. If you're looking for something a little more straightforward, Etsy woodsmith Donnie Fauber has this writer's personal recommendation. His smart cases for iPads are generously proportioned (no skimping on wood or leather here) and work just as well as the official ones. They'll last for years — or at least until Apple changes its design again. Neither of these strike your fancy? They're just two we liked; search around for other options, sizes, devices, and finishes. 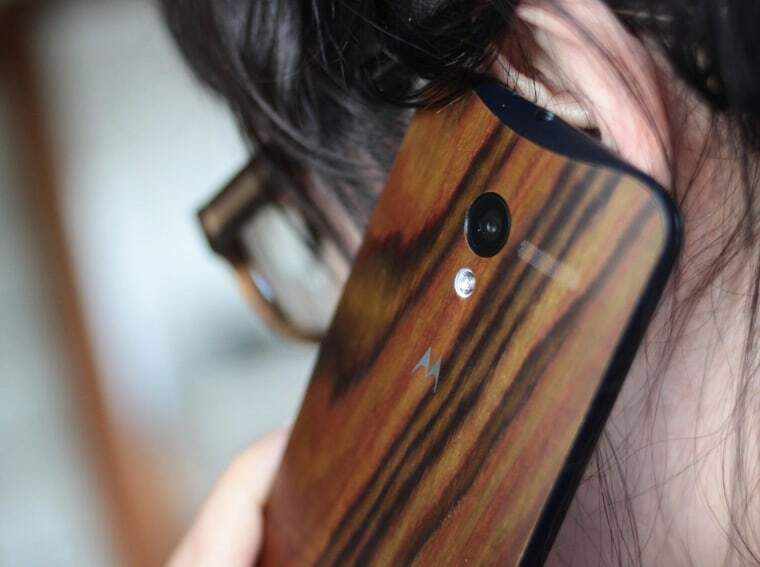 Motorola made waves over the last year with its highly-customizable Moto X and a set of real wood back panels. We're fans of the phone, and an actual wood backplate is better than sticking a decal or case on there — but to be honest, we were disappointed by the color and feel of the wood itself. Don't get us wrong, it's still very cool, but don't expect a slab of gnarled oak — this feels much more like Ikea veneer, and the different varieties are actually the same wood stained in different patterns. Still a big improvement over a plain plastic back, though.